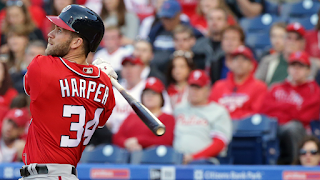 Max Scherzer and Bryce Harper led the Nationals to an easy 8-1 win over the Phillies on Saturday night at Citizens Bank Park, their seventh straight victory. Scherzer not only allowed one run over seven innings, but he hit a two-out, two-run double to right in the fourth inning to give Washington a 5-0 lead. Harper hit a sacrifice fly to score the game's first run in the first before he ripped a two-run home run to right field in the fifth to make it 7-0 -- his third straight game with a homer. The Nationals (9-1) can sweep the series with a victory Sunday afternoon. Phillies right-hander Aaron Nola allowed a career-high seven runs in five innings, asCameron Rupp provided the only offense for the Phillies with a solo homer to left in the fifth. "The big hit was the two-run double by Scherzer," Phillies manager Pete Mackanin said. "That really kind of iced it." Chris Heisey hit a pinch-hit home run in the ninth for Washington. Scherzer dominates with arm, bat: After allowing a single to Maikel Franco in the first, Scherzer retired 12 straight batters before allowing Rupp's homer. The Phillies had runners in scoring position against Scherzer three times -- in the first, fifth and seventh innings -- but did not score. Scherzer allowed five hits and struck out seven for his second win in three starts this season. Starting from behind: For the second straight night, the Nationals hung a crooked number on the Phillies in the first inning. On Friday, it took Jeremy Hellickson 45 pitches to retire the side, allowing five runs. Nola fared slightly better Saturday, surrendering only three runs on 19 pitches in the first inning, but Washington continued to pile on in later innings. Phillies starters entered the series with a MLB-best 2.14 ERA. They now enter the series finale Sunday with a 3.42 ERA. Harper hitting for power: In his last three games, Harper has three home runs and nine RBIs. According to the Elias Sports Bureau, Harper joins Jim Bottomley as the only opposing players in modern MLB history (since 1900) to have two hits and at least one home run in five straight games at Philadelphia. Offensive infusion? Mackanin has been desperately searching for an offensive boost, with the Phillies averaging 2.58 runs per game. Things reached a tipping point on Saturday, when Mackanin inserted Darin Ruf to left field after Phillies left fielders had a combined .299 OPS through 11 games. Ruf went 0-for-4 with three strikeouts as the Phillies' offense tied a franchise record, going the first 12 games of the season without recording 10 hits in a game. The mark was previously reached in 1967. Heisey now has 12 pinch-hit home runs during his career, the most by an active Major Leaguer. After Harper singled to left in the third, Nola attempted to pick him off first base. Although Harper dove back and was initially called safe, Mackanin challenged the call and replay officials overturned the ruling on the field. That was Mackanin's fourth challenge this season; he has won two of them. Nationals: The Nationals try to sweep the series and earn their eighth straight win in Sunday's finale against the Phillies at 1:35 p.m. ET. Gio Gonzalez will make the start for Washington. On Tuesday, Gonzalez pitched in his first game since March 27 and threw six shutout innings with four strikeouts. Phillies: The Phillies send Charlie Morton to the mound in the series finale. Morton's last outing kicked off a streak of 22 2/3 scoreless innings for Philadelphia starters. In two games against the Nationals, the Phillies' starters have allowed 13 runs (12 earned) in eight innings.